it's time to share the goods received from cold hands, warm hearts. thank you sandy a la mode and much love, illy for hosting this great swap! i can't wait to see what everyone else has on much love illy's link up here. thanks again, for this fun winter swap! I'm so happy you like everything!! :) I'm picking up my package at the post office tomorrow after work and will post tomorrow night. Can't wait!! Look at all that fabulous stuff! 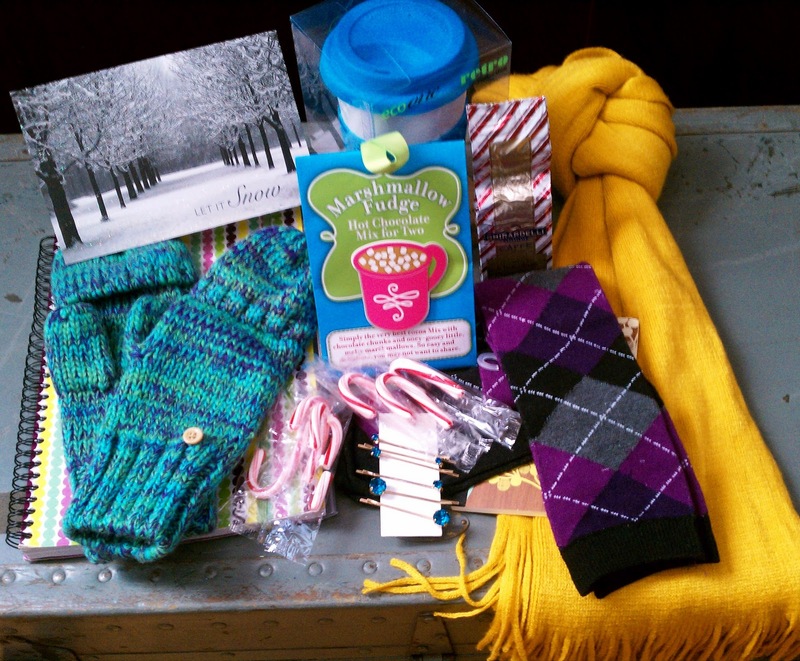 Notebooks, hairpins, knee-high socks, coffee mug, coffee, hot cocoa for 2, scarf, and mittens?! Whew! I loved participating in this exchange but I love meeting all these new bloggers even more! Very nice! And, of course, I was very grateful to have shared the coffee. By the way, our house looks pretty sweet in that photo. That's some photographer you've got. and hey, sweet blog! this is the first time i've been here. love it! and thanks for joining the fun, friend! happy tuesday!! Fun! I sent cocoa in mine too. Great minds. :) The scarf is a gorgeous color! You got such a fun package!!! And i'm diggin your blog. Going to check it all out now! loved the stuff you got! i read that you're an assistant director! my boyfriend is in schoool trying to do the same thing! So colorful and pretty! What a fun package to receive! Ahh, your package is super sweet! It was so lovely of Maria to include all the awesome gifts! How long have you been in Boston? We visit MA often as my hubs is originally from Southborough - it's right outside of Boston. Here is my swap- nice to meet you! I adore the color of your mittens! Your swap partner sent you a wonderful package! Love from a chwh participant!